Under the stewardship of former Dublin football captain Tommy Drumm, family business Collen Construction is building on its strong track record by endeavouring to remain at the leading edge of innovation within the industry. In 2009 Tommy Drumm found himself Senior Project Director based in Perth visiting Barrow Island, an A-class nature reserve established in 1910 and situated off the coast of Australia between Perth and Darwin. Chevron was building a liquefied natural gas plant and Drumm was hired by Kentz to oversee the design and build of a new village required to house 4,000 employees. During the four-year project duration, Tommy was introduced to the concept of modularisation – bathroom and bedroom modules were pre-fabricated in Thailand and shipped in large containers to the island to be assembled into what was effectively 12 separate two-story detached hotels with 4,000 en-suite bedrooms. Drumm worked for Collen for four years in the early part of his career. At the time, the company was mainly focused on civil engineering projects but upon his return in 2015 as Managing Director, the Company was firmly established as a Tier One Main Contractor. The rolling video presentation in Drumm’s office provides an impressive overview of recent and ongoing projects – they range from a 354-bed student accommodation project on the UCD campus, to a project that will double the size of the Frascati Shopping Centre, to highly complex projects in the biopharmaceutical and data centre sectors. Originally established in 1810, Collen is steeped in heritage and family tradition. It currently employs over 230 people directly and the turnover for year-ending 31/3/18 is €200m. Success in recent years has been largely driven by a keen awareness of more demanding client requirements and the firm’s ability to continue to lead through innovation. In the fast-moving data and pharma sectors, high levels of quality assurance and world-class safety are paramount. Three years ago, Collen brought in third party consultant Stephen Fulwell to conduct a gap analysis of its safety system. “Throughout my career I have prioritised improving safety, from developing systems from scratch to making sure that whatever business I was managing, it focused on staying ahead of the curve and not chasing it,” says Drumm, who has also worked in Qatar, Kuwait, Spain, Portugal, and the UK in addition to Thailand and Australia. For over seven years Collen has been classified with an A-rating under the Construction Industry Federation Safe-T-Cert system. The gap analysis put the ISO 18001 standard on its radar and the team decided to try to raise the bar and bring all of its Health and Safety systems up to this standard. The ISO 45001 standard provides a framework to improve employee safety, reduce workplace risks and create better, safer working conditions. “It doesn’t just look at safety, but also leadership and the wellbeing of staff, including for example, how they get to work. It is also about sustaining the business, which really resonates with us,” notes Drumm. On Barrow Island, Drumm was chairman of Chevron’s Incident and Injury Free Safety Committee. In that capacity, he recognised the importance of including the supply chain in health and safety initiatives. 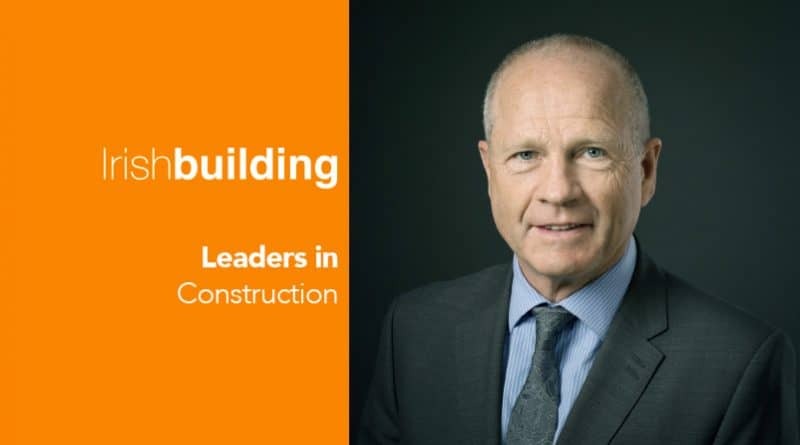 For Construction Safety Week last year, he asked Collen’s Commercial Director Donal Hennessy to front-up a special event in Croke Park for the company’s supply chain. Around 150 sub-contractors attended and took part in eight breakaway workshops. The end result was a safety charter they all agreed to sign up to. Building Information Modelling (BIM) is playing a crucial role for Collen in relation to meeting client expectations on time and to the highest standards. Drumm cites the example of the recently completed €20m fast-track design and build fit-out project Collen completed next door to its head office on East Wall Road in Dublin – the firm built the original €100m Gateway development including 157 residential apartments and 16,100 sq m of office space currently leased out to ESB. All team meetings for Collen’s award-winning 30-32 Molesworth Street project were run on the back of the BIM model. It involved the refurbishment of three listed buildings at the front and demolition and rebuilding behind them, with a beautiful atrium connecting the old with the new. “We tried to run that project paperless. This was a very tight environment at the back of a busy street,” notes Drumm. So far, Collen has managed to find the right people to drive its growth as the business spreads across different sectors, according to Drumm. It is currently developing a graduate programme and hopes to take in eight graduates this year. Jack Collen, an eighth-generation member of the Collen family, recently joined the business after finishing an Engineering degree in Dublin Institute of Technology. Drumm himself graduated as an Engineer from Trinity College Dublin in 1977. He realised from early on that while he found pure engineering interesting, his real passion was with people. His first job was for the Office of Public Works, working on the Boyne drainage scheme. Collen was next for four years, and then Cooney Jennings where he was appointed Contracts Manager and worked on the extension of St Luke’s Hospital in Stillorgan. In 1984 Drumm decided to join McInerney and spent the first 7 years running construction business Gulf Construction and a separate timber-framed business Spacemaker, in Qatar. In total Drumm worked for McInerney for 25 years at home and abroad and finished as Operations Director for the UK and Ireland before heading to Australia in 2009. He ran Laing O’Rourke’s construction UK South business in 2013-14 before returning to Collen. “I moved reasonably quickly into general management. I loved dealing with all the different people in different roles,” he recalls. “Having played for Dublin [GAA football] for years, I knew that on a team you’re only one piece and for the team to win everybody has to pull together,” notes Drumm. “There is a great mix of qualified Engineers and trades-based people at Collen. Coming up through the trade having worked on the tools yourself gives you a wonderful understanding of materials and what it is you’re asking people to do.